The 2012 College World Series field has officially been set after the final three teams qualified for the final segment of the 2012 NCAA Tournament by winning their respective Super Regionals on Monday. Though the event will begin at 5 p.m. on Friday at TD Ameritrade Park in Omaha, NE, the No. 1 Florida Gators will participate in the last “first round” game when they take on the No. 8 South Carolina Gamecocks on Saturday at 9 p.m. live on ESPN. 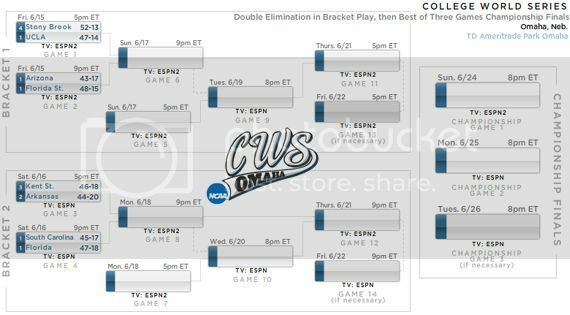 The CWS is split up in two four-team brackets, each of which is double elimination and can consist of up to seven games. The victors of each bracket will square off in a best-of-three Championship Series beginning on June 24. 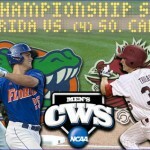 Florida (47-18) has been placed in the second bracket along with South Carolina (45-17), No. 20 Arkansas (44-20) and Kent State (46-18). The Gators are 4-3 against that field and 3-0 against the first bracket after registering a season sweep of No. 3 Florida State (48-15). No. 4 UCLA (47-14), No. 11 Arizona (43-17) and Stony Brook (52-13) make up the remainder of the first bracket. 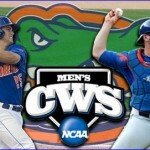 UF is making their third-straight appearance at the CWS for the first time in school history. Florida fell in consecutive contests to UCLA and FSU in 2010 but made it to the Championship Series before being swept by USC last season. South Carolina has won back-to-back national titles and is also making their third appearance in a row. I guess I am confused but I thought Florida was the number one overall seed. How do they become the 3 seed in the CWS? I just really don’t understand how college baseball works. OK think of it this way. Florida, being the best No. 1 seed (there were 16 total, one for each regional) was put in a bracket that way they did not play better than the 16th-best 1 seed in the Super Regional and 8th-best 1 seed in the first round of the CWS. The assumption being that the best team in each regional and each super regional won their games. That did not happen because there were upsets, just like in any tournament. In those cases certain teams may have what are perceived as “easier” first-round matchups in the CWS. But if every 1 seed had won, Florida would have the “easiest” first-round match-up based on ranking because South Carolina was the 8th-best 1 seed. There really is no reason not to reseed the cws. If they did reseed it would be UF-Stony Brook in the 1st game and USC-Arizona in the other. Our first game would be easier, but I think our bracket overall would be more difficult. Just win the 1st and it’s a huge advantage. Your crazy if you want to play Stony Brook right now. They almost had as many players drafted as UF and are raking. They are a hot team that I’d like to stay away from. Not saying USC is a cakewalk but people are getting too hung up on their past years success. Also watch out for Arizona as they will knock out FSU in the first round. I can see both sides.Reseeding would be nicer for the higher seeds, but it would penalize those teams who already had the upset just to get where they are. I sort of understand, but it doesn’t make much sense to me that Florida played NC State ( 1 seed) in the Super Regional, while Arizona and UCLA played lower ranked teams (3 and 2 respectively) in their Super Regionals. A one seed of a region should be better than any two or three seed, so Florida went through the tougher road and don’t get a reward? Still doesn’t make sense to me. If Florida lost even one of their games I would understand. I suppose Arizona kind of makes senses because they beat a team that didn’t lose any games (Stony Brook) where NC State had lost one in the regional, but how does UCLA get ahead of Florida? Because the one-seeds in those regionals lost…so they got lucky and didn’t have to play one-seeds. Just like if it happened in any other tournament. It almost feels like the first game is make or break. If they win they will have a huge advantage in getting to the finals. If they lose it will be very tough to win 4 straight. I’m not sure I understand all the griping here. You all are aware that the brackets were set before the first game of the first regional was played? This just happens to be the final 8 teams standing. That would be like complaining in the elite 8 of the basketball tournament how we have to play a really tough team while some lower seeded team gets to play 12th seeded directional state U. There is nothing pre-determined, the chips just fall where they do based on the teams winning.